His contemporaries called him as ’Duke of Oncsásza’, ’Prince of Galbena’, and the later generations called him as ’The apostle of tourist of Bihar’. He was a member of Transsylvanian –Carpathian Association, Royal Hungarian Scientific Corporation and Hungarian Geographical Corporation, but his personality and activity unfortunately pass out of mind. He was a son of an Armenian family who got noble title. His forefathers moved to Arad from Gyergy during Terézia Mária period then his relatives bought land at Seprős where he was born in 23 August 1847. He studied at Arad and Pozsony. He spoke well in Romanian, German, French and Italian and of course in Hungarian. Gyula Czárán liked engineering and music, but according to the traditions of the era; at the request of his father he became law student at Pest, then Vienna in 1865-67. He was awarded for his first mods in 1871. But he had to finish his learnings because of his serious illness (smallpax and pneumonia). His father brouht home, but the convalescenced went on slowly. After this he wore big mustage covered his scars. He tried to improved his health by travelling mostly to the famous waterng-places. He travelled to Austria, France, Italy, Germany, Swiss, Prague, Istanbul, Skurati, Helgoland, Transsylvania and Sub-Danube. He travelled to the mountain of Bél near by Seprős. Sometimes he went to Biharfüred (the bishop's place) of the on horseback. He was gripped by the beauty of the nature. During one of his travellings he met with Gyula Pethő who was the leader geologist of the institute of geology. 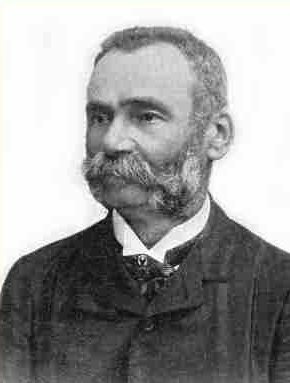 Gyula Pethő inspirated him for discover the Transsylvanian land. Gyula Czárán learned a lot of things from Pethő: geology, zoology, and botany. After his father's death he gave up one's life to tourism. He married off his two well-endowed sisters. He hired out his lands and rented a villa at Menyháza - but he lived here during winter in effect. From Spring to Fall he travelled to mountains, forests, caves. He spent all of his time and money to discover the countryside. He could only get information about the secret miracle of Transsylvanian mountains from shepherds, lime-burners and charcoal-burners. It was a really hard challange, because the superstitious hillbillies was scared because of his appearance (big, tall man with huge mustage). He wore a wide-collar hat, long, large surcoat, red shirt and short and he always held a stick in his hands. If someone didn't know him, they thougt that he was a wolf or something like that. People thought that he had godlike power: they gave a chase to him and tried to brush off with dogs. Slowly the inhabitants liked him. Finally inhabitants loved him because when roads was under construction he asked them for help. When a road was finally complete, he gave loans (interest-free!!) to inhabitants to buy pack-animail. So hillybills got stable wages: they lead tourists, assumed to carry packages. Most of the roads consturcted by Czárán was 10 kilometres, so visitors had to stay for days. And those tourists had a very big and heavy packages. When roads was under construction they needed to detonate somewhere. When he was 45 years old in 1892, he started another school at Selmecbánya, he became a mining-student to understand detonating and geology. Finally he became a scolar. He had conflicts with authorities too. Once he travelled near to Verespatak with Kristóf Ballauer (who was a parish priest), when they was arrested by gardames. Authority did not believe that they were a scientist and a priest. They got-out only when their landowner friend prouved them. That story didn't bewilder him. He found nicer and nicer gazebos and sights. He discovered little miracles of nature that he shared with everyone. He built many roads and tried to describe it in books. His main work is guide to trips in Biharfüred: 'Kalauz biharfüredi kirándulásokra. Függelékül rövid tájékoztatóval a Bihar-hegység egyéb természeti nevezetességeiről'. Nowdays this work is a historical curiosity. It was printed in Lázár Süsmann's press at Belényes in 1903. It purposed to that people who love the nature of Biharfüred. It contains many describes of routes, lands in the introduction there are some rhymed rules. He wrote about distance with special methodology that called step of Bihar, it explained very detailed in introduction. Sometimes it is over-detailed but really particular. Nowdays visitors can use this work too, if changes and vegetation allow travelling. He used two kinds of time-data. In opening part he counted time with breathing space. In the whole text he described distance between two points. If someone try to accomplish the whole land without any breath-time, he have to travel almost 300 hours. He wrote many amusing guides about tourism in newspapers (for example in Erdély and Turisták Lapja, Nagyvárad, Szabadság). He wrote legends that published in two omnibus edition (Legends of Sztina de Valéi). Menyháza (in Romanian language: Moneasa) is a little village and bath at the northeastern part of Arad county, the western edge at Mountain of Bél, approx. at 290 metres from sea-level. Its name was recorded first in 1592 as Monyásza. You can find it on the map of János Lipszky (in 1806) and in every books in the 19th century with this name, but it is called Menyháza by Imre Kéry in 1859. Losonczy family possessed this territory from the end of 14th century to the middle of 16th century. After this Turks and the Principality of Transsylvania sharing this land. It disengaged in 1693. In the second half of 19th century Rajnald the duke of Modéna surmounted this territory, but he wasn't loyal so he lost all of his lands. Then Néverey family possessed in the first half of 19th century. In the middle of the century count of Waldstein had the rights and at the end of this century Török family surmounted this land too. The Roman catholic church of the village built by Imre Bohus in 1761, then Kereszély Waldstein reconstracted. There are two other church at this place: an reformed, and an ortodox. Hungarians, Romanians and Slovaks lived here in the second half of the 19th century. The majority was the Romanian nation. Population of Menyháza aws 772 in 1910 - mostly Romanians. According to census in 1992 the population was 1291 - 24 Hungarians, 7 Germans and the others Romanians. There are famous thermals in this village. Allegedly Mihály Vajda came to this village to treat himself in medicinal spring around 1600. Earlier indications are legends. The first bath was bulit in 1864. Nowdays visitors can use covered and open-air parts too. This is the reason why this buildings more modern than the other buildings at this time. This is a kindly target for inhabitants of Arad because of graphic milieu. Economy of Menyháza based on iron industry in the second half of the 19th century. But nowdays situation changed. Famous 'red marble' have went out of mind since 1887. This material is used for ornament outside or inside part of buildings in Bukarest. Inhabitants created a traditional stone-cutter school. In the middle of the village there is a memorial for the school made by Danila Andritiou. Another place this is treasure, but usual at home. At Menyháza many parts of the village made with red marble: underside, ledge, drip, border or flagstone. The second biggest dripstone-cave is the cave of Czaran in the historical territory of Hungary and this is the biggest dripstone-cave of nowdays Romania. Otherwise it is an almost unknown cave in circle of scientist too. The first professional review made by an Austrian scientist called Schmidl, then Sándor K. Nagy made another expose about this area in his book called 'Biharország' (published in 1884). 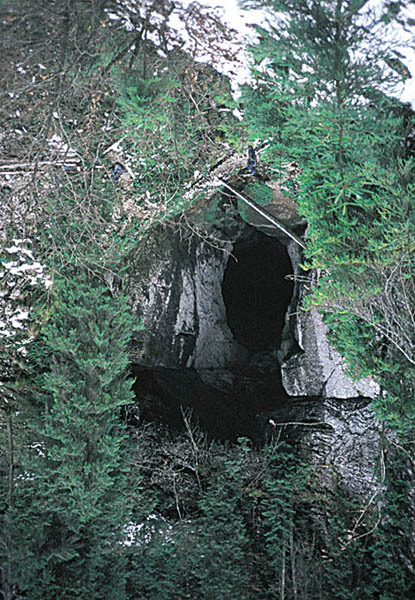 Both of them said that this cave is on the same level as dripstone-cave of Aggtelek and Adelsberg. But they knew about the half of this cave according to Schmidl maps. Gyula Czárán called 'The big turist apostle of Bihar' delineate the whole cave in his book titled as 'Kalauz biharfürdei kirándulásokra' (Guide to tours of Biharfüred) in 1903. He named the main dripstones and created the signs of the roads - it is actually nowdays too. He worked out poetic names with 'ß'. He is characterised by exactitude and measured steps of distance at the cave. The number of steps are 4037 that is almost same the whole distance that is 3410 metres. Almost all of natural sights went out of mind when Gyula Czárán died in 1906.